For more information visit www.epoxy.com. It is said that there are two types of concrete floors, those with cracks and those that are going to crack. Cracks and potholes in plant and shop floors are a major problem to safety and aesthetics. Here we will discuss what causes them. We will also discuss how to repair them quickly and economically. For those floors that have not cracked we will discuss how to minimize or prevent the cracking and potholes. It is a common misconception that heavy loads on the floors cause most flooring problems, and so it cannot be prevented. If you are building a new plant or shop floor there are steps that will help to prevent most flooring problems. For existing flooring problems we will discuss how to fix the problems and prevent the problems from getting worse. For new construction make sure you specify and get high quality high strength concrete. Create a box-out form around beams, pipes and other penetrations that go through your floor. Be sure that the corner of your box-outs line up with the saw-cut joints that you will be putting in the floor. Penetrations through the concrete cause a “weakened plain”. A weakened plane is typically created at the shortest distance between the box-outs. That is typically from the corner of one boxed out area to the next closest boxed out area. Do not allow your concrete finisher to over finish your concrete. Concrete finishers tend to over-finish concrete because they are concerned that if they don’t the owner will not like it. Over-finished concrete does look better than properly finished concrete until the over finished starts to deteriorate. The deterioration cause by over finished concrete typically does not take very long to occur. The best finishing of concrete leaves it flat, but does not bring up the “cream” in the concrete. It will not look as shinny and smooth but concrete that is not over finished will look more attractive and be more functional over time. Bringing up the “cream” in the concrete is done by over working the mix or adding too much water or adding water to the batch. The “cream” consists of dust from the aggregate and Portland cement. This “cream” creates a great looking finish at first, because it is so weak, it chips easily. This “cream” has too high a water content so you tend to get micro-cracking in the surface. When your concrete finisher is power troweling your concrete and starts splashing water into the surface as he is finishing it he is about to over trowel the concrete and bring up the cream. It is time to get the concrete finisher to stop troweling. Water curing of the concrete is what most state highway departments require to cure concrete bridge decks. Wet curing is favored over other methods by the US Army Corps of Engineers. Wet curing will help to stop the top of your concrete from drying out too fast. If you cure with a curing compound instead of water, you will need to remove the curing compound to install high quality coatings and sealers. Proper curing will help to prevent “curling” of the concrete slab, and help to prevent micro-cracking (crazing) of the surface. Curling is caused when the top dries and shrinks before the concrete underneath dries and shrink. This works much like a bimetallic strip used in a thermostat, the concrete will twist upwards or curl. Proper curing helps to prevent concrete curling and the cracking that will result from it. Another major advantage of wet cured concrete that is not over finished is that there is much less surface preparation required when you go to coat or seal it. Cut expansion joints often enough, wide enough, and deep enough. Typically the best way to cut concrete down to 16 foot by 16 foot squares or even smaller. The larger the spacing between saw cut joints the more likely you are to get a random crack where you do not want it. The concrete should be cut-up as square as possible. Care should be taken that all the saw cut joints line up with each other in a checkerboard pattern. Be sure the cut is at least 1/3 of the way through the slab, and that the cracks are 1/4 inch or wider. That way all the plastic shrinkage (drying) cracking should occur under the saw-cut relief joint. Seal or coat the concrete to protect it against wear and chemicals. Epoxy.com Product #223 Water Based Curing Compound, Sealer and Bonding Agent is a two component water based epoxy curing that is used to both cure and seal concrete. Epoxy.com Product #223 www.epoxy.com/223.htm is an excellent choice for installers that want a long pot life product that is easy to use. Epoxy.com Product #223 is an excellent choice as a sealer where waiting 28 days to seal the concrete is not an option. Product #223 can be installed as early as early as 7 days after the concrete is poured. Giving you early protection. Allow the concrete to dry for 28 days so that most of the shrinkage at the expansion joint has taken place. Clean the crack thoroughly, then install a bond breaker “rope” in the bottom of the joint. Then fill the joints with Epoxy.com Product #11 Saw-Cut Control Joint Filler– www.epoxy.com/11.htm. Epoxy.com Product #11 Saw-Cut Control Joint Filler is a 100% solids zero (0) VOC, flexible epoxy joint filler for saw-cut joints of concrete slabs on grade, or to repair existing slabs.Random cracks and improperly filled expansion joints are where the potholes in plant/shop floors are born. As steel and hard rubber wheels pass over these unfilled cracks and joints it hammers the edge of the crack in the direction of the travel. This action cause small chips. As the process continues small chips become larger chips. Soon you have a small pot hole and the damage continues to accelerate. Epoxy.com Product #11 Saw-Cut Control Joint Filler absorbs the impact and shock of heavy loads and steel wheeled traffic, preventing erosion of control joint edges. Epoxy.com Product #11 prevents the “jack-hammer” effect on the joint that you are traveling towards. This will help prevent most if not all of the “pot-hole” effect that most plant floors see developing at their expansion joint over time. If you want to seal your floor using a 100% solids epoxy use Epoxy.com Product #899 – www.epoxy.com/899.aspx for sealing the concrete. 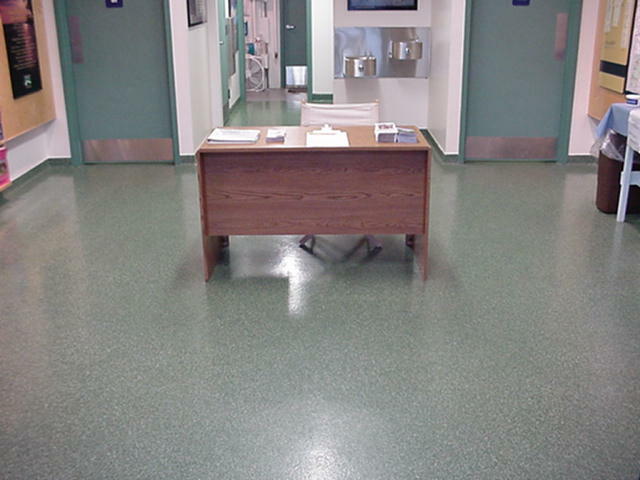 Epoxy.com also has a wide variety of shop floor coatings and trowel down systems. Contact Epoxy.com Technical Support Department with your specific needs for a recommendation. Random cracking in plant / shop floors can easily and economically be repaired with Epoxy.com Product #685 Liquid MMA Polymer Crack Repair Resin a penetrating gravity feed crack healer for concrete. It is a two component Methyl Methacrylate resin system that polymerizes in place. The extremely low viscosity will penetrate into concrete cracks as fine as 0.003 inches. Epoxy.com Product #685 welds the crack back together making the concrete as strong as it was before it cracked.Repairing a Shop / Plant Floor with Epoxy After it is Damaged. For those who have already built their buildings you can still fill all the joints especially in the traffic areas with Epoxy.com Product #11 – www.epoxy.com/11.htm. Filling the joints with Epoxy.com Product #11 will prevent additional potholes from forming in areas where there are none yet. To fill the “potholes” in level areas you will typically want Epoxy.com Product #25 – www.epoxy.com/25.htm. Epoxy.com Product #25 is a 100% solids epoxy resin and specially selected aggregate system. Units are preproportioned for ease of mixing and use on the jobsite. Epoxy.com Product #25 is a flowable, self-leveling grout, with handling and physical characteristics superior to similar grouts. Epoxy.com Product #25 is conveniently packaged and makes “pothole” repair in your shop/plant floor quick, easy, and economical. The Epoxy.com Product 25 is the best material when you are looking for a convenient packaging and is easy to use for small jobs. For larger projects or surfaces that have a slope so you cannot use a self leveling material should use Epoxy.com Product #10 – www.epoxy.com/10.aspx and Epoxy.com Product #82 Mortar Blend Aggregate. With the right mixing equipment you can put up to 100 pounds of #82 into 1 mixed gallon of Epoxy.com Product #11. That gives you a nice stiff mix, and excellent economy. Epoxy.com Product #10 is a low-mod material, with high strength. That makes it perfectly suited for outdoor patching. Epoxy.com Product #10 is the best material for most large jobs. If you cannot allow overnight for your epoxy patching material to cure you will want to use Epoxy.com Product #680 Polymer Concrete. Product #680 is a methyl methacrylate reactive resin concrete used for repair of concrete structures with a minimum of downtime. Epoxy.com Product #680 develops strength rapidly. Epoxy.com Product #680 Polymer Concrete can be put in service in as little as one hour even at temperatures below freezing. The Epoxy.com Product #680 polymer concrete produces extremely high strengths and is chemical resistant. Epoxy.com Product #680 is prepackaged for easy mixing and placing at the job site. Epoxy.com Product #680 Polymer concrete cures hard in about 1 hour, allowing for quick turnaround of the area being patched. Epoxy.com Product #680 is the best material when you need the patch to set in about an hour. 1. Carefully measure epoxy resin and hardener. Mix for 3 minutes. 2. Add aggregate to the mixed resin and hardener above, and mix completely. 3. Pour out the epoxy resin hardener and aggregate blend onto the concrete. 4. Then pull a very tight troweled coat over the entire surface, filling the low spots while scraping as much epoxy resin and aggregate material as possible away from the high spots. The material for a “scratch-coat” is with Epoxy.com Product #10 – www.epoxy.com/10.htm and Epoxy.com Product #78 Self-Leveling filler. Epoxy.com Product #10 and Product #82 mortar blend aggregate is the best blend for building ramps and smoothing uneven transitions between slabs. discussed above) and a chemical resistant flooring system installed over the patching system. Contact Epoxy.com Technical Support for assistance. You are currently browsing the archives for the Methyl Methacrylate (MMA) category.